Though it was less than a year ago, I can hardly remember a time when I didn’t think about Haiti every day. About the people—especially the women and children—who inspire me and with whom I feel so deeply connected. I was intimidated by Haiti, too, by the level of pain that I felt maybe I couldn’t handle. Like the caring person who shields her eyes from a commercial with desperate, emaciated children or abused animals, because it’s just too much. Because you don’t want to think about it. But I did think about it. And I realized it was well past time to step out of my comfort zone. The Global Seva Challenge. Initially I saw those looks of disbelief: $20,000? For Haiti? That’s crazy. Not going to happen. Put your energy and talent somewhere more… rewarding. But these 9 months of effort, of endless emails and phone calls, of inevitable disappointment, of stepping off the ledge of what is familiar and easy, offered me an unexpected pathway to go deeper into myself. My voice was already pretty loud—trained as a lawyer, lobbyist, and yoga teacher, I am quite well conditioned to say what I mean, clearly and, well, loudly. But I nonetheless always had approached with trepidation the act of saying what I truly believe, of offering up myself (and not just someone else’s cause, teachings, or truth). I learned something important about my own fear of putting myself out there, naked, for a cause like this: it just wasn’t going to fly. I couldn’t leave the talking to someone else. I couldn’t fall back on the script. It was all me. Me, and the women in Haiti to whom I was beginning to feel an inextricable link. As if their struggle—to set aside the blinding, devastating pain of loss and daily hardship, and step forward to make change for their families and their communities—could become my own. This challenge meant I had to connect with people on a deeper level than perhaps I ever had before. I had to make an unforgettable impact. And the response of my community was beyond anything I could have imagined. They took up the cause too. They showed up, they sent emails and posted to Facebook. And when I needed it most, they just came up after a yoga class and said, “Don’t worry, I know you’re going to make it.” They knew even when I didn’t. The Seva Challenge was so much more than a fundraising project or a volunteer opportunity. In my own urban, mid-career-shift, privileged bubble, it was an opportunity to empower myself. I exercised my creativity in a way that I hadn’t in so many years. I worked with my hands—crafting jewelry to sell for the cause—and my feet—boots to the sidewalk asking for donations, making sales, and connecting with friends and strangers. I found so much more passion teaching a yoga class when I knew everyone in the room was there to support them, the people of Haiti. Not just me, not just themselves. It’s amazing how the energy shifts. I feel so drawn now to the women I’ll be meeting in Haiti. They are the rocks of their families and their communities, particularly after the earthquake. I only hope that I could muster a fraction of the resilience, the passion and the drive these women have demonstrated in the face of innumerable hardships. Because of incredible organizations like Fonkoze, and because of some of the funds I helped to raise, they are getting the meaningful, long-term assistance they need to step into their own power. Fonkoze is a non-profit organization, Haiti’s Alternative Bank for the Organized Poor. 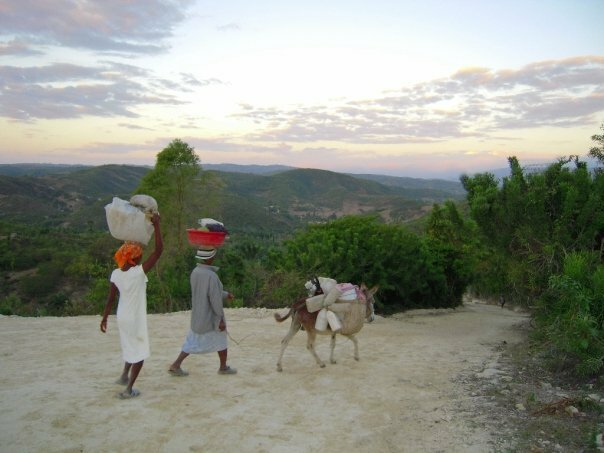 They provide financial services to the poorest in Haiti, especially women, tens of thousands of them, who receive literacy and business education and small loans to provide for their families and support backyard enterprises like crops and crafts. Because of Fonkoze’s programs, women who had little hope now are growing their micro-businesses, learning to read, and pulling themselves slowly out of poverty. Watch this video to meet some of the women of Fonkoze. These women are a true inspiration to me. Maybe I’m biased, but I really believe that women are more resilient, more passionate, and more powerful than they are given credit for. It’s nothing against men. But I have watched women, myself included, rise from the dark depths of pain and loss, and transform themselves and the world around them, in their own small ways. The sad fact is that too many women around the world are denied the opportunities men have, the opportunities in my own community that women take for granted—to own property, manager their own money, start a business, or work anywhere other than in the kitchen. There is an opportunity in Haiti, right now, for real change to emerge. Individuals, many of them women, are stepping forward, despite all of the obstacles and the easy path to hopelessness. They are passionate and strong and determined. And I believe they have the power to transform Haiti’s future. Along my Seva journey after I had been pushing hard to promote events and seek donations through social media, an acquaintance commented, with a well-disguised mix of respect, surprise, and disbelief…. You just don’t give up, do you? Nope. I didn’t. Why would I? They don’t know me, but nonetheless I could just feel that those women in Haiti were counting on me. No one ever made history without also irking someone. Making a peaceful, joyful nuisance. I leave for Haiti in less than three weeks. I am so honored to be a part of the Off the Mat, Into the World’s 2011 Bare Witness Tour. Seeing, experiencing, learning, documenting this moment in Haiti’s history. In my own tiny way, being part of the change. Thank you! This entry was posted in Uncategorized and tagged creativity, haiti, practice, purpose, seva, yoga by kristin adair. Bookmark the permalink.